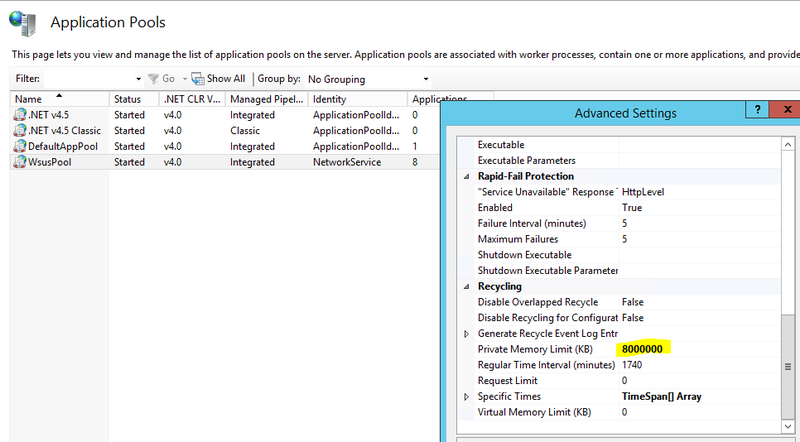 every minute one informational event: A worker process serving application pool ‘WsusPool’ has requested a recycle because it reached its private bytes memory limit. until the service terminates: Application pool ‘WsusPool’ is being automatically disabled due to a series of failures in the process(es) serving that application pool. When I restart the application pool, the error occurs after about 10-20 minutes. after the limit has been raised, everything went without problems. This server serves over 10.000 clients with Windows updates. Thank you for this post. Solved my problem.